Julie Belaga & Russ Brenneman Receive CTLCV's First Founders Award! 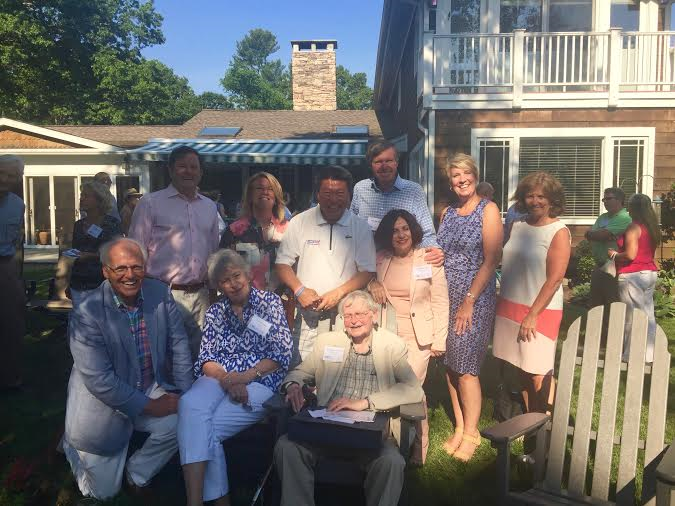 On June 26, the Connecticut League of Conservation Voters (CTLCV) awarded the first Founders Awards to life-long environmental champions, Russ Brenneman and Julie Belaga. The award recognized their tireless dedication to protecting Connecticut’s most important assets-our open spaces, clean air, water, wildlife, rivers and coastlines. One of their legacies was co-founding CTLCV to ensure that strong state policies and laws were adopted to enforce these protections. Together with conservation champions at State Capitol, CTLCV has helped Connecticut to become a national model for enlightened environmental policies. In addition the CTLCV Founders Award, both were presented with citations from the Connecticut General Assembly in recognition of their individual contributions and lasting impact on the environment for now and future generations. Among the many attendees paying tribute to Russ and Julie were elected leaders from all levels of government, including State Senators Toni Boucher, John McKinney, Ed Meyer, Tony Hwang; State Representatives Mary Mushinsky, Jonathan Steinberg, Laura Devlin, Brenda Kupchick; Weston First Selectman Nina Daniel and Westport First Selectman Jim Marpe, former US Senator Chris Shays. Belaga became involved in local politics in Connecticut. She served as Chairman of the Westport Planning and Zoning Commission from 1972 to 1976. She served as a State elected official from 1976 through 1986 where she had significant legislative successes on a number of critical environmental issues among them, leading drafting and implementing Connecticut's coastal management laws. In 1990 Belaga was appointed by President George H.W. Bush as Region 1 (New England) Director of the Environmental Protection Agency (EPA). President Bill Clinton later appointed her to the Export-Import Bank, where she led the Bank's efforts to increase financing for U.S. firms that export products and services that benefit the global environment. Russell Brenneman is an environmental lawyer who has been involved in land conservation and environmental issues in Connecticut for more than thirty years. He helped organize several of the earliest community land trusts, drafted the legislation enabling conservation easements in this state and chaired the Connecticut Greenways Committee that was the precursor of the Greenways Council. A graduate of Harvard Law School, Mr. Brenneman was counsel at Murtha Cullina and Richter and Pinney, where he founded its environmental practice group. He was one of the organizers of what is now the Environmental Law Section of the Connecticut Bar Association. Larry & Mary Lou Weisman, Charlotte & Chuck Stabinsky, Chris Neubert, Joel & Carol Davis, Nancy Steinman, David Jaffe, Antony Grassi, Astrid Hanzalik, Edward Richardson, Murtha Cullina, Jonathan Sackler, Joan & Bill Grabe, Dorothy & Jon Fox, Dan Levinson, Joseph & Lori Goertz, Katharine O'Brien, Cathy Talmadge, Wendy Batteau, Alan & Janet Nevas, Martin Resnick, Julie Belaga, Russ Brenneman, Lucy Johnson & Bill Klein, Susan Addiss, Woody Bliss, David Anderson, Lawrence Robinson, Josephine Fuchs-Luscombe, Dan Aron, David & Sydney Brown, John & Bernice Hibbard, Charles Catania, Marianna McCall, Judi and Lou Friedman, Zac & Amanda Zeitlin, Cheryl Dunson, William Ruskin, George Chappa, Kathy & Tom Failla, Karen Burnaska, Gordon Geballe, Kathy Wadsworth, Howard Aibel, Nancy Blair, Tom Swarr, Ted Sullivan, Pat & Bob Jaeger, Maggie & CJ Carey, Robert Moore, Ned Lamont, Ginger More, Joseph Sledge, David Sutherland, Stewart Hudson, Howard Lathrop, Curt Johnson.